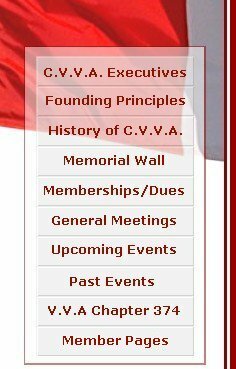 Vietnam Memorial Wall Washington DC - Canadian Vietnam Veterans Association - Manitoba - C.V.V.A. 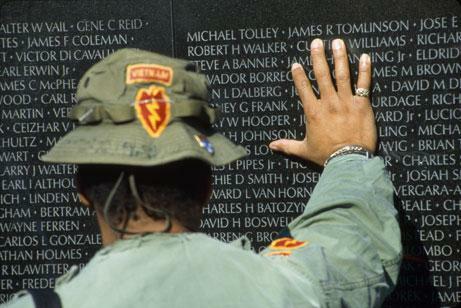 Vietnam Veterans Memorial Wall in Washington, DC, was built in 1982. Designed by the American sculptor and architect Maya Ying Lin, it is a sloping, V-shaped, 493-ft (150-m) wall of highly polished black granite that descends 10 feet (3.05 meters) below grade level at its vertex. On March 26, 1982, 100 Vietnam veterans in unison turned the earth on the National Mall breaking ground for the Vietnam Veterans Memorial in Washington, D.C. The black granite Memorial, inscribed with the names of those who were killed or remain missing in action, was dedicated on November 13, 1982. 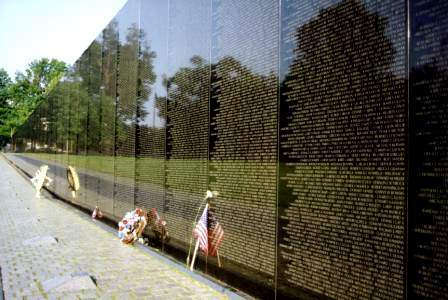 Often called simply "The Wall," it is inscribed with the names of the more than 58,000 killed or missing during the Vietnam War. The austere, abstract nature of Lin's design, which was selected after a nationwide competition, at first made it a controversial way of memorializing the war's casualties. In the years since its construction, however, the simple, evocative, and starkly dramatic wall has become a national shrine, drawing 4.4 million visitors each year, more than the Washington Monument or the Lincoln Memorial. More than 20,000 Vietnam veterans, their families and the general public, attended the 25th anniversary of the Annual Veterans Day Observance at The Wall on November 11, 2007 in Washington, DC. For just the third time since The Wall's dedication in 1982, the more than 58,000 names of those men and women inscribed on the black granite memorial have beeen read aloud in Washington, D.C. on November 07-10, 2007.